Here’s a recap of my first session (of four) of Tablet Time. Attending were 3 children and 2 parents. Because I only have 6 iPads, I have limited the registration to 6 kids, so half-full isn’t bad for this rural library. I started by reading a few books. The “featured” book was Press Here by Herve Tullet. Kids love this book—it is so interactive, they love seeing the “magic” that happens. My only caution–when the book asks readers to blow on the dots, hold that book up and away from you, because little kids do not know how to blow without spitting. 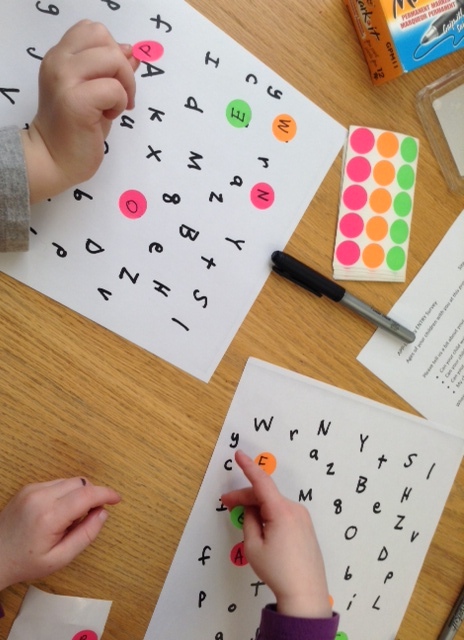 Our next activity was dot alphabet matching. I created a page of the alphabet—upper and lower case (see picture). Each child got a sheet of dots. We wrote their names, one letter per dot, and they got to search for the letter on the sheet. Then they pressed the dot over the letter. They wanted to do more than just their names, and I gave parents extra pages of letters and sheets of dots to do the activity at home. We tried another activity, which was to write their names on paper and put tiny dots along the letters, but this was too hard for the youngest ones and not as exciting as looking for letters. Next up, the app Press Here. One thing I love about this app is that there are really no instructions. You just figure it out, and play. There are 15 different games, all involving dots. There’s a fireworks game which involves making, well, fireworks. There’s a music game, a sports game for 2 players called “Inside Goal,” a memory game, and more. 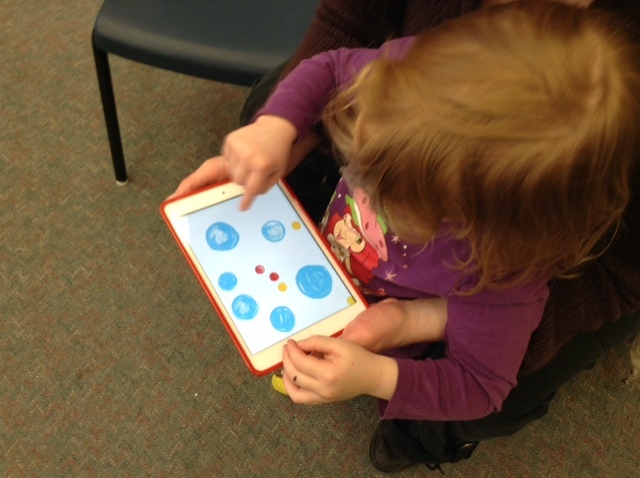 I asked the parents to spend some time with their kids testing out this app, talking to them and working together. After they spent about 10 minutes with that app, they had free-play time. The kids did enjoy this app—though the youngest of them (3 years old) enjoyed it more. She played with it for quite a while, and I heard some good parent-child interaction going on. One of the moms was looking for good apps for her son who is in speech therapy. He really enjoyed Alphabet Car and was even able to unlock a new level in the game–he was really enjoying saying the letter aloud when he ran it over with his bus. The kids really enjoyed each having their own iPads, which is why I think I will keep this program small. When I tried this program before, we had 6 iPads for 20 people, and while they were really good about sharing, they much preferred this format of being able to really spend some time with the apps. 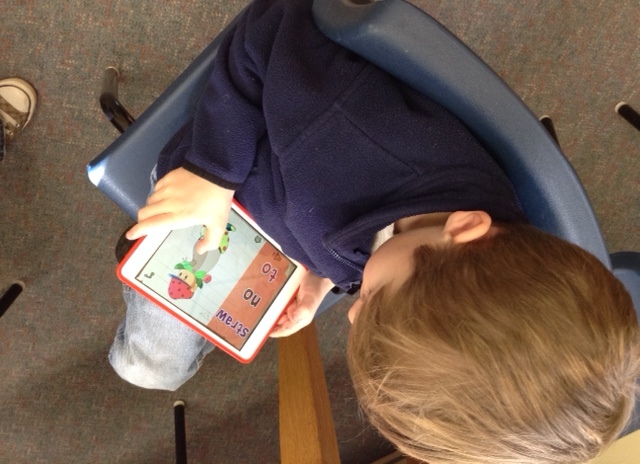 Posted on April 4, 2014, in Apps, Interactivity, iPad, Story Time and tagged Angela Reynolds. Bookmark the permalink. Leave a comment.